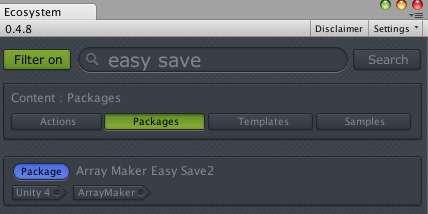 Following some work on ArrayMaker to support Easy Save 2, I made also two convenient actions that works with regular Fsm Variables and Easy Save. Easy Save provides already custom actions to load and save variable, but it's one action per variable type, here, these actions works with FsmVar and lists, so you can add many variables or any types in one action. Those are great actions, very useful. It would be handy to have just 1 action for both save and load, but with a dropdown to select between the functions.... so if I want to save 20 variables, I can do that, then copy&paste the action and just switch one dropdown to load all 20 - rather than having to readd them manually. Well, it goes a bit against the principle of clarity for actions, cause if an aciton can either get or set, load or save, then it will be difficult at time to debug or clearly understand what is currently at stake. I would consider other approaches like using arrayMaker to load save an entire array or hashtable of data, that would be the solution I would push forward for this. also, another approach is to go more object oriented. What are these values you want to save, can you give us a sample of what they are? It saves out all the tags with "/' in front of them, *edit: even with variables set to none. Getting an EndOfStreamException error. Any thoughts? Wanted to bump this and see if anyone has any ideas? Oh gosh! Jean you're crazy! odd. I tested with the latest easySave from the asset store and it works properly. can you try on a fresh project? maybe it's the txt file that is corrupted. Have you contacted the author? maybe he'll hint us on the possible issue with such error? 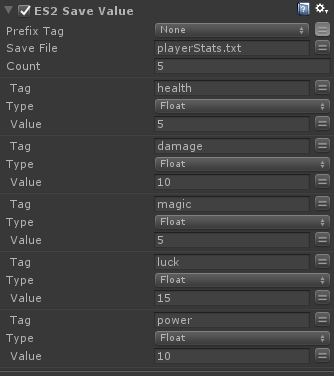 Is there a way to make the tag values that get saved not have the "/" prefix before them when saving with these actions? So that when loading them separately using the singular action I wouldnt have to put a "/" before everything? sorry to bump! but here's a bump! ok, sorry for the delay. can you download it back from the Ecosystem, it should now be corrected. No worries for the delay, you're a popular man! Any particular search terms under Ecosystem to find it? I can't seem to get it by name or with any ES2 tags.. I've found and downloaded it. I went ahead and fixed it locally just deleting the "/" at line 71, huzzah! As an aside... here's a glorious avatar gif for you for being so cool!